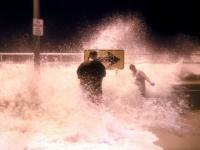 Coastal flooding in Manasquan (Monmouth County) as a result of the December 9th nor'easter. Photo by Denise Casagrande (@Free_DennyGurl). Clouds prevailed in this darkest month of the year, making for some rather persistent dreary conditions. Until the last week of the month there were only two days (the 4th and 7th) where the sun outperformed the clouds across NJ. At least the year ended on a bright note, with lots of sun during five of the last six days. With the clouds came a fair amount of precipitation, and given milder-than-normal conditions, the vast majority was in the form of rain. Statewide precipitation averaged 4.79". This is 0.88" above the 1981–2010 mean and ranks as the 27th wettest December since 1895. The mean temperature of 38.9° was 3.3° above average and ranked as the 15th warmest on record. Snowfall averaged 0.6", some 3.5" below average and ranked as the 19th least snowy December. A strong nor'easter brought strong winds, multiple inches of rain, minor to moderate coastal flooding, and beach erosion on the 9th. With the abundant cloud cover, there were a number of December days with rather small diurnal temperature ranges. However, on occasion, either due to the sun breaking through or warm frontal passages, temperatures made it into the upper 50°s to mid 60°s. In fact on the 1st, the warmest day of month, West Creek (Ocean County) and Egg Harbor Township (Atlantic) reached 72°. Three other stations got to 70°, while 40 of the 56 NJWxNet stations were in the 60°s. However, in the northwest corner of the state, Walpack (Sussex) only got to 47°. Eight other days saw one or more stations top out at 55° or higher. Cape May Courthouse (Cape May) was 55° on the 3rd and West Cape May (Cape May) saw 57° on the 6th, with four other stations at 56°. It took until the 16th to reach the upper 50°s again, with Piney Hollow (Gloucester) at 57° and Dennis Township (Cape May) 55°. The 17th brought a high of 56° to Jersey City (Hudson) and Mansfield (Burlington). Very mild air invaded NJ on the 24th, and by the predawn hours of Christmas near record-high temperatures were achieved. Evening maximums on the 24th included 65° at Cherry Hill (Camden) and Mansfield, and 64° at six stations. The warmth never made it to a few low-lying areas in north Jersey by midnight, with the daily maximum of only 50° in Wayne (Passaic). Highs on the 25th were 65° at Cherry Hill, Mansfield, and Hamilton (Mercer), 64° at 12 stations, and 60°–63° at 27 other locations. The coolest location was Atlantic City Marina (Atlantic) at 56°. The warmth continued on the 27th, with Egg Harbor Township, Greenwich (Cumberland), and Piney Hollow reaching 60°. Five stations topped out at 56° and eight at 55° on the 28th. Colder weather prevailed on the last day of the year, when the top reading of highs of only 35° was achieved at four stations, while High Point Monument (Sussex) only got to 22°. The general absence of cold air intrusions, along with the frequent nighttime cloud cover, resulted in mild daily minimums throughout the majority of the month. Only six days saw one or more stations fall below 20°. On the 5th, Walpack bottomed out at 15° and Pequest (Warren) at 19°. Walpack was 14° on the 7th and High Point Monument 17°. High Point and High Point Monument fell to 11° on the 8th, when Walpack reached 13° and Wantage (Sussex) 14°. It was not until the 27th that sub-20° cold returned to NJ. In the interim, daily minimums across the state did not fall below 33° (the two High Point stations) on the 23rd or 38° (High Point Monument) on the 24th. Walpack reached 19° on the 27th and 18° on the 29th, when Pequest was 19°. Walpack and High Point bottomed out at 14° on the 30th. The previously mentioned cold on the 31st included minimums of 7° at Walpack, 8° in Pequest, and 34 NJWxNet stations dropping to 11°–19°. 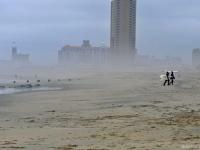 Atlantic City Mariana was "mildest" at 27°. As was often the case in 2014, a wide range of monthly precipitation totals was observed across NJ in December. On the wet end, the Community Collaborative Rain, Hail and Snow (CoCoRaHS) Network observer at Belmar (Ocean) measured 7.58", followed by CoCoRaHS observations of 7.51" in Point Pleasant Beach (Ocean), Ocean Township (Monmouth) 7.36", Brick Township (Ocean) 7.25", and Long Branch (Monmouth) 7.18". Vernon (Sussex) was the driest location at 2.49", with Hackettstown (Warren) at 3.04", Boonton (Morris) 3.13", two locations in Wantage 3.23" and 3.31", and Sparta (Sussex) 3.30". Maximum monthly snowfall included 3.3" in Highland Lakes (Sussex), 2.0" in Hardyston (Sussex), Holland (Hunterdon) 1.9", and Greenwich (Warren) 1.8". On four occasions rainfall exceeded an inch at more than one location. The first event barely reached that mark when scattered periods of mainly rain fell from the late afternoon of the 1st until the afternoon of the 3rd. 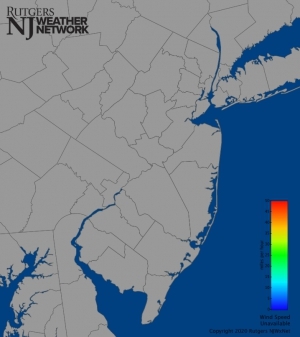 Stafford Township (Ocean) caught 1.08", Woodbine (Cape May) 1.03", and Ocean Township (Ocean) 0.99". Totals were generally within a few tenths of 0.50" across all but the wetter coastal areas. In some locations this event began with a dusting of light snow and sleet. The next event from the late afternoon of the 5th until the early morning hours of the 7th brought a widespread soaking to the state. Some 205 CoCoRaHS gauges caught between 1.00"–1.93", with only 15 reports of 0.50"–0.99" from the far northwest and deep southeast. Freehold topped the list with 1.93", followed by Matawan (Monmouth) with 1.87", Red Bank (Monmouth) 1.81", and Old Bridge (Middlesex) 1.79". A minor but interesting snow event took place along the coast on the 8th. Winds from off the Atlantic generated ocean effect snow that accumulated to 0.5" in Ocean Township (Ocean), and 0.4" in both Howell (Monmouth) and Point Pleasant Beach. At best, a few inland areas saw flurries. As mentioned in the introduction, a sizable nor'easter visited NJ on the 9th. The storm was strongest along the coast. While not even coming close to the storm on December 11, 1992, it brought the largest storm surge to the coast since Sandy. The surge measured 2.76' at Atlantic City (Atlantic), which is considered moderate. The 2.77' surge at Sandy Hook (Monmouth) is just below the moderate criterion for that location. Low-lying roads went underwater at multiple high tides and beach erosion was moderate. Winds gusted to 55 mph at Harvey Cedars (Ocean), 54 mph in Tuckerton (Ocean), 49 mph at Sea Girt (Monmouth), and 46 mph in Seaside Heights (Ocean). Four other stations gusted in the 40–45 mph range, with 14 others between 30–39 mph. Rainfall exceeded 3.00" at five CoCoRaHS stations, including Belmar 3.17", Ocean Township (Monmouth) 3.15", Point Pleasant Beach 3.12", Lavallette (Ocean) 3.06", and Lacey Township (Ocean) 3.03". Some 40 other stations caught between 2.00–2.99" and 150 stations from 1.00"–1.99". The lowest totals were in Boonton 0.56", Pennsville (Salem) 0.62", and East Greenwich (Gloucester) 0.63". The storm began as a period of freezing rain at higher elevations in north Jersey, icing trees and walkways. Several roads across the Millstone River in Somerset County were closed for a day due to minor flooding. Snow squalls followed on the backside of the storm during the afternoon of the 10th. Highland Lakes received 3.3", Hardyston 2.0", Wantage and Sparta 1.5", and both Jefferson Township (Morris) and West Milford (Passaic) 1.4". The final rainy episode of the month began late on the 22nd, ending in the predawn hours of the 25th. While it was mainly a persistent period of light rain and drizzle, moderate rain fell on the 24th. The event tally was as much as 1.61" and 1.55" at two Woodbridge (Middlesex) locations, 1.60" in Belmar, 1.58" at Ocean Township (Monmouth), and 1.57" in Long Branch. Some 1.38 CoCoRaHS observers measured between 1.00"–1.61", with 70 others seeing between 0.50"–0.99". There was a dusting of snow at higher elevations to begin the event. Windy conditions prevailed at the High Point Monument NJWxNet station throughout most of December. On all but two days the maximum wind gust exceeded 20 mph and on seven days gusts were higher than 40 mph. Starting off the list of daily gusts equal to or exceeding 40 mph was Wantage with a 41 mph gust on the 1st. Harvey Cedars reached 42 mph on the 7th. The strong winds of the 9th were discussed above. A six-day run of strong gusts at High Point Monument and Wantage began on the 10th with 46 mph at the Monument. The 11th brought a 41 mph gust to this location, Wantage peaked at 42 mph on the 12th, both stations reached 46 mph on the 13th, the Monument was at 46 mph and Wantage 45 mph on the 14th, and the Monument got to 40 mph on the 15th. These strong winds were somewhat localized, as for instance on the 13th the next highest gust in NJ was 29 mph at four stations and 27 mph at Harvey Cedars on the 14th. This local wind maximum is a function of the northeast trending topography atop and just to the east of the Kittatinny Ridge and a prevailing northwesterly flow at lower levels of the atmosphere (to learn more about this type of occurrence, click here). This phenomenon was also seen on the 18th when High Point Monument gusted to 50 mph and Wantage to 48 mph, with the 34 mph gust at Harvey Cedars next highest. Strong winds were more widespread on the 25th, with Wantage gusting to 57 mph, the Monument to 49 mph, the generally sheltered High Point station 300 feet below the crest of the ridge an impressive 43 mph, and 26 other NJWxNet stations gusting to between 30–39 mph. The highest surface barometric pressure of the month was on the 8th with impressive observations of 30.65"–30.70". The 25th brought the lowest pressure of 29.50"–29.55". The statewide annual temperature of 52.1° is 1.1° below the 1981–2010 mean. However, when examining the complete 1895–2014 period of record, it is only 0.2° below that long-term average. This ranks 2014 as the 56th coolest year of the past 120 (tied with 1922). The warmest day was July 2, when Hillsborough (Somerset) reached 97°, the 2014 state maximum. The coldest day was January 7, when the noon temperature ranged from -3° at High Point Monument to 13° at West Cape May. The coldest temperature of the year was -18° at Walpack on February 11th and 12th. Annual precipitation was 50.54". This is 3.60" above the 1981–2010 mean and ranks as the 20th wettest on record. This was 5.24" above the 1895–2014 mean. The wettest locations in the state were found along the coast and included 66.76" in Lacey Township, 63.15" at Belmar, 59.55" in Brick, and 59.48" at two stations in Howell and one in Berkeley Township (Ocean). Franklin Township (Gloucester) also had a wet year with 61.66". On the opposite side of the ledger, Sussex and Cape May counties were driest. This included 40.70" in Wantage, 42.56" in Middle Township (Cape May), 43.18" at Wildwood Crest (Cape May), and 45.20" in Andover (Sussex). Upper Deerfield in western Cumberland County was also dry at 45.00". The wettest day of the year was April 30, with 4.00"–5.00" at many locations and as much as 6.52" in Washington Township (Gloucester). The wettest storm at any location was 8.94" in Millville on August 12th–13th. 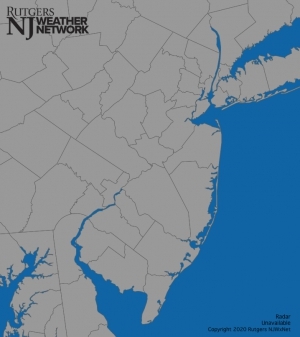 Only one tropical system affected NJ in 2014. South coastal sections were brushed by Hurricane Arthur, which passed offshore on July 4th. Rainfall totaled 0.50"–1.25" along the coast, the wind gusted to 40 mph at Harvey Cedars and rip currents made for dangerous swimming. It was a protracted winter that stole the biggest environmental headlines of 2014. Frequent snows and some of the coldest weather in 20 years made for a memorable January through March. Read more about this and see what we in the state climate office consider to be the major weather and climate events of the year in our top 10 list that follows. Listed below is the Office of the NJ State Climatologist's ranking of the top 10 weather and climate events of 2014. More about each event can be found in the monthly narratives posted on njclimate.org. You might be tempted to rearrange the rankings, particularly as some of the events may have affected you more than others higher on the list. That's the enjoyment (and frustration!) of lists. This was the second consecutive year that was not too eventful for NJ weather and climate (goodness, we remain stunned by 2011 and 2012). Of course there is still plenty to talk about. "Endless" winter. Well at least it seemed that way to many. January–March temperatures averaged 30.5°, which is 4.9° below normal. 20 snow events occurred where 2" or more fell in one or more locations around the state. This includes four events in December 2013. Arguably this was the most impactful winter on day-to-day life since the winter of 1993/94. 3rd coldest December–February since 1982. Coldest minimum temperatures, in some locations, since 1994. At noon on January 7, High Point Monument (Sussex) was -3°, the coldest reading in the state, and West Cape May was 12°, the coldest daytime readings since January 19, 1994. Minimum temperatures at Walpack (Sussex County) fell below 0°on 27 days (includes occurrences in Dec–Mar). While not a record for a NJ station, it may fall second to the 30 days at Layton in the winter of 1960/1961. Statewide snowfall averaged 54.3" (October–April). This is 28.4" above average and the 7th snowiest season since records began in 1894/95. January ranked 8th and February 7th most snowy. Two largest statewide events on January 2–3 and January 21–22. Three significant March events in south Jersey, each missing the northern counties. The south ranked 7th snowiest, while statewide the rank was only 28th. Heavy rainfall and flooding on April 30th–May 1st. 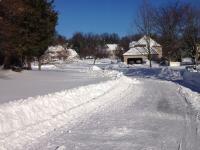 Washington Township (Gloucester) received 6.52". Locations in 11 counties received 5.00" or more, with 6 counties between 4.00"–4.99". Widespread flooding, including the 7th highest flood crests of the past century on the Millstone River at Blackwells Mills and the Raritan River at Bound Brook (yet below crests in 1999, 2007, 2010 and 2011). August 12–13 deluge from Cumberland County to the central coast. 8.94" in Millville (Cumberland) was a 100-year (1% chance) event. Lacey Township (Ocean) reported 8.35". Part of a narrow zone of storms that brought 13.27" to Islip, NY. Dry late summer and early fall in northern and central areas. As a result of below-normal rainfall, streamflow, and ground water levels, this region was placed in the D0 category (abnormally dry) in the US Drought Monitor. At year's end only Warren and Sussex counties remained in this category. Coastal flooding was at the high end of "minor" to the low end of "moderate." In most locations it was the worst since Sandy, but nowhere near that event. Wind gust up to 55 mph at Harvey Cedars (Ocean) and 49 mph in Sea Girt (Monmouth). 3.17" of rain in Belmar (Monmouth). June–August average temperature of 72.0° was 0.8° below the 1981–2010 mean. This ranks as the 55th warmest of the past 120 summers, and exactly matched the 1895-present mean. This followed four consecutive summers with temperatures averaging in the top 15 (since 1895), an unprecedented run of abnormal warmth. Most weekends had superb weather. White Thanksgiving for the northern half of the state. Thanksgiving eve brought up to 12.5" of snow at Montague (Sussex). A white Thanksgiving morning (inch or more on the ground) north of the Route 1 corridor. First widespread one for the north since 1989. It wanted to rain along the coast, but not so much the case at the extreme ends of the state. Annual precipitation totaled 66.76" in Lacey (Ocean), 63.25" in Belmar (Monmouth), 59.55" at Brick (Ocean), and 59.48" at two locations in Howell (Monmouth) and in Berkeley Township (Ocean). In the southwest, Gloucester County was wet, with Franklin Township receiving 61.66" and 57.10" in Clayton. On the other side of the ledger, in the northwest, Sussex County was dry with only 40.70" falling at Wantage. So too was Cape May County, with 42.56" in Middle Township and 43.18" at Wildwood Crest. - Wildfires erupted across the state in April before the end-of-month dousing put an end to them. Prior to the storm, an extended period of dry weather included multiple days with gusty winds and low humidity. Fires included ones of 1500 and 300 acres in Burlington and Ocean counties, respectively. to 232 days at West Cape May (Cape May: March 28–November 14). The range in 2013 was 103 days. - Average monthly temperature were below average for seven months, four of them more than 3° below. Only one of the five above-average months was more than 3° above average. Precipitation was above average during six months and below average for six. Only two months were over an inch above average and one more than an inch below. Enter a zipcode to view the latest conditions, forecasts, graphs, maps and more for the location nearest to you. A chance of showers, mainly before 5pm. Cloudy, with a high near 63. Breezy, with a south wind around 21 mph, with gusts as high as 32 mph. Chance of precipitation is 40%. New precipitation amounts of less than a tenth of an inch possible. A chance of showers before midnight, then a chance of showers after 1am. Patchy fog after 3am. Otherwise, mostly cloudy, with a low around 51. South wind 9 to 16 mph. Chance of precipitation is 40%. New precipitation amounts of less than a tenth of an inch possible. A slight chance of showers after 3pm. Patchy fog before 9am. Otherwise, partly sunny, with a high near 60. South wind 7 to 10 mph. Chance of precipitation is 20%. A chance of showers. Mostly cloudy, with a low around 47. South wind 6 to 9 mph. Chance of precipitation is 40%. New precipitation amounts of less than a tenth of an inch possible. A chance of showers. Partly sunny, with a high near 62. West wind around 7 mph. Chance of precipitation is 40%. New precipitation amounts of less than a tenth of an inch possible. A chance of showers before 9pm. Partly cloudy, with a low around 52. Chance of precipitation is 40%. New precipitation amounts of less than a tenth of an inch possible. A chance of showers after 9pm. Partly cloudy, with a low around 53. Chance of precipitation is 30%. A chance of showers. Partly sunny, with a high near 62. Chance of precipitation is 30%. A chance of showers. Mostly sunny, with a high near 59. Chance of precipitation is 30%.